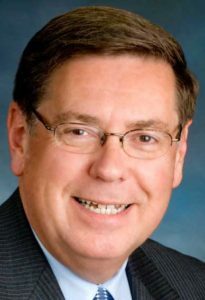 MORRIS – State Sen. Jim Seward, R-Milford, today said he has received assurances from Frontier Communications and from John B. Rhodes, state Public Service Commission chairman, that frequent lengthy outages in telephone service in the Butternut Valley will be address. The problems are in western Otsego County and contiguous areas of Delaware County. “After learning of telephone outages in rural portions of my district, I called on Frontier Communications to spell out what is being done to correct deficiencies and ensure customers that they will have reliable service moving forward,” said Seward in a press release issued over the weekend. In January, the senator sent letters to Frontier Communications calling on the company to address deficiencies in rural portions of their coverage area immediately and to make financial restitution to customers who were without service. Senator Seward also requested a full review by the New York State Public Service Commission. The letter from Mason also stated that customers who notified Frontier of an outage would receive credit on their bills. “Reliable communication service is essential in the event of an emergency, for economic development, and for quality of life. People who live in rural areas should not be left behind, or treated like second-class citizens,” Seward concluded. Anyone experiencing a service problem should contact Frontier Communications at 1-800-921-8104. Complaints can also be registered with the PSC at 1-800-342-3377 or online at www.dps.ny.gov<http://www.dps.ny.gov>. Why can’t I read this without a paid subscription? Jim Seward has every reason to be skeptical where Frontier is concerned. Those of us who had begun referring to ourselves as “Frontier’s Victims” have heard it all, again and again, over these many months…and, in many or most instances, Frontier failed to remedy the problems. Not to mention that very often Frontier’s subscribers were led to believe that the technical problems lay within their homes and their equipment. Now, we have come to understand that, for the most part, these problems can be traced to Frontier’s reluctance to invest in repairs to its infrastructure. We recently received copy of a complaint filed against Frontier Communications by the State of Minnesota. The details of this complaint, filed with the state’s Public Service Commission, might very well have been written right here in Otsego County! Once again, we would like to express our appreciation to members of Otsego County government for their prompt assistance and attention to our needs!